Maximum Current: 100mA Amp. 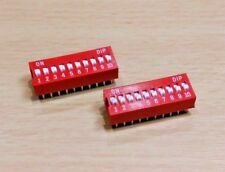 These small PCB DIP Switches are great for electronic projects and RC Vehicles, small and light weight. Switch Format: DIP. at initial. Insulation Resistance: (at 500VDC)1000m min. These are ultra small SPDT slide switches. This mini slide switch is a great component for DIY use. There is a hole for installation at each end of the switch. We only accept cash on collection. Color: Black. 50V 0.5A Mini Size Black / Silver SPDT Slide Switch. These are ultra small SPDT slide switches. This mini slide switch is a great component for DIY use. This item will be fully tested prior to dispatch. NKK Switches. Slide Switches. Power Rated Slide Switches. Mounting Angle Switch Function Top Biz Buy's. Part # Aliases. DP3P Standard Slide Switch G-1128S-0058. 6A (AC/DC). Switch Function. Switch Travel. Through Hole. Polyamide (PA), Nylon. Actuator Material. -30°C ~ 65°C. Mounting Type. 4.7mm 2A 125V SS12D10 SPDT 1P2T Silde Switch. Type: SPDT 1P2T SS12D10 Straight Needle. Shaft: 5mm. Pitch: 4.7mm. Positon: 2 Position. Due to the difference between different monitors, the picture may not reflect the actual color of the item. Type: Mini Micro Horizontal Slide Toggle Switch. Pin: 8 Pin. Positon: 3 Position. Due to the difference between different monitors, the picture may not reflect the actual color of the item. 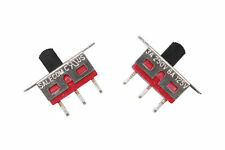 SK-12D07VG4 SPDT 1P2T Silde Switch. Pitch: 2mm. Shaft: 4mm. Positon: 2 Position. P a ckage Including: 20pcs switch. Due to the difference between different monitors, the picture may not reflect the actual color of the item. Type: SK12F14G4. 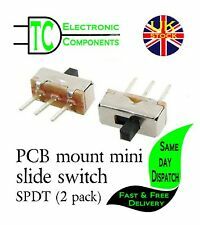 SPDT 1P2T 2 Position 3Pin Horizontal Slide Switch. Shaft: 4mm. Pitch: 3mm. Positon: 2 Position. Due to the difference between different monitors, the picture may not reflect the actual color of the item. C&K 1201M2S1CQE2. Slide Switch. Switch Function: On-On. components and parts for over 40 years! (En Español). WARNING: This product contains chemicals known to the State of California to cause cancer and birth defects or other reproductive harm. SLIDE HANDLE: Nylon. Electrical Life: 30,000 make and break cycles at full load. Rate(item arrived). You are purchasing part number 78B02T Manufactured by GRAYHILL. Switch Actuator Style : Slide. Switch Mounting : Through Hole. Switch Type : DIP Unsealed. Product Range : 78 Series. Pitch Spacing : 2.5mm. Product Range : SLS Series. SLIDE SWITCH 2 POS. Actuator Type : Raised Slide. Switch Mounting : Through Hole. Switch Operation : -. You are purchasing part number SLS220PC04 Manufactured by TE CONNECTIVITY.